Nick Jones, writer for the popular show Orange is the New Black, has penned a play that features a character not quite like many you’ve met. His name is Trevor and he is a chimpanzee who had fame as a youth but now is going through growing pains. Trevor is an exploration of communication and humanity and is both hilarious and troublesome. 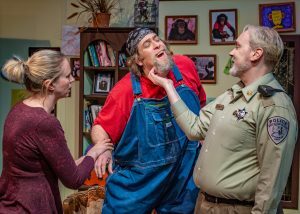 Join R. Scott Cantrell who plays the title character, along with Director Charlie Cardwell and Louisa Martin who plays next door neighbor Ashley on this week’s Stage Talk. Trevor performs at Cyrano’s Theatre Company May 18-June 9. ORIGINAL BROADCAST: Friday, May 18 at 2:45 p.m.